Libby's Little Addiction: December My Monthly Hero Release! December My Monthly Hero Release! It's kit release day, and the December My Monthly Hero kit is so beautiful. I am in love!! 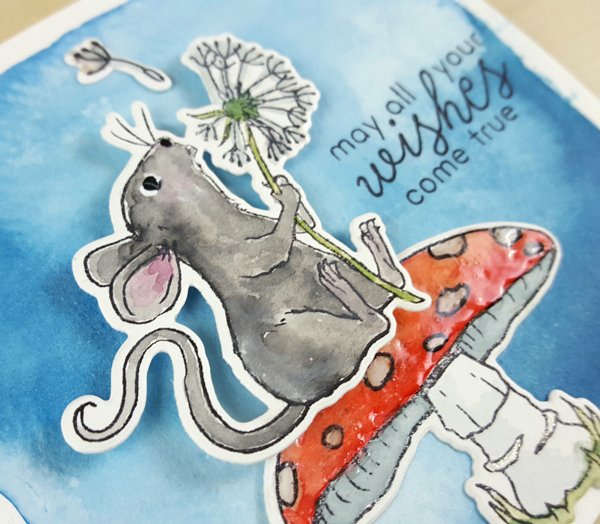 The fairies are just gorgeous, but for today's card I had to play with the super cute mouse! I watercolored the images, as well as created the background, with some Daniel Smith watercolor paints, after stamping with Intense Black Ink. For a little extra something, I used the glitter pen in the kit to add sparkle to the dandelion, and went over the mushroom with Crystal Clear Lacquer. If you'd like to see more of the cards I created this month, take a look at the December kit landing page. I'll share more details about these cards over the next few days. 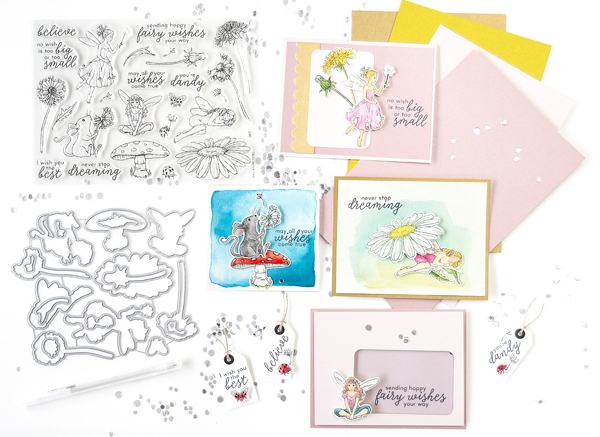 And here's a look at the full December My Monthly Hero kit - so beautiful! Now it's time to hop. I can't wait to see what all of these fabulous stampers came up with! Like every month, there's a giveaway - be sure to comment on every blog in the hop, and a lucky winner drawn from the comments will receive a free kit! The winner will be announced on the Hero Arts blog. Comment by Sunday night, December 9th! This kit is so cute, it's going to be a quick sellout - be sure to grab yours before it's too late! And check out the add-ons too, they are wonderful! The mouse in this kit is cute! Love your card. The mouse in this kit is my favorite image and I really like how your card highlighted the mouse in the blue background. Love that mouse. All the images are great but the mouse..oh my! That mouse is adorable! Off to check out your other cards. I love the watercolor look of your card! super sweet card... love that little mouse! That mouse is so stinkin’ adorable. Love your card! Great coloring! Cute cards! Love all the coloring! I love your cute watercolored card. What a whimsical card! I love your watercoloring. Very cute cards! Thank you for sharing your techniques with us! Adorable little mouse. Love the edges of the blue background!! All four of your cards are fantastic!! I especially like the fairy sitting at the edge of the window! Great job!! Thanks for sharing!! This is an amazing kit!! My all-time favorite for sure!! Oh Libby what a gorgeous wee mouse, and you have really made him the star of this beautiful card. What adorable card! It's really a sweet scene!!! Adorable card! :) Love how it looks with that watercolor background. I love the way you created this pretty watercolor background! It really brings out that adorable little mouse! really cute inspiration today! How beautiful! Your coloring is gorgeous. TFS! Love your delightful card, so cute! Beautiful card! I love your watercoloring. That little mouse is so cute. Adorable just doesn't describe that cute mouse! Beautiful watercoloring, too. Like your use of water color, something I need to try more of! So cute and fun. Love your mouse. Thanks for sharing you designs. Gotta say I do really love this little mouse. Sweet card, so well done. Cute card. I love the mouse! The little mouse is so sweet! Love! Very nice! That mouse is adorable! Love your sweet little mouse card! This set is amazing! Thanks for sharing! 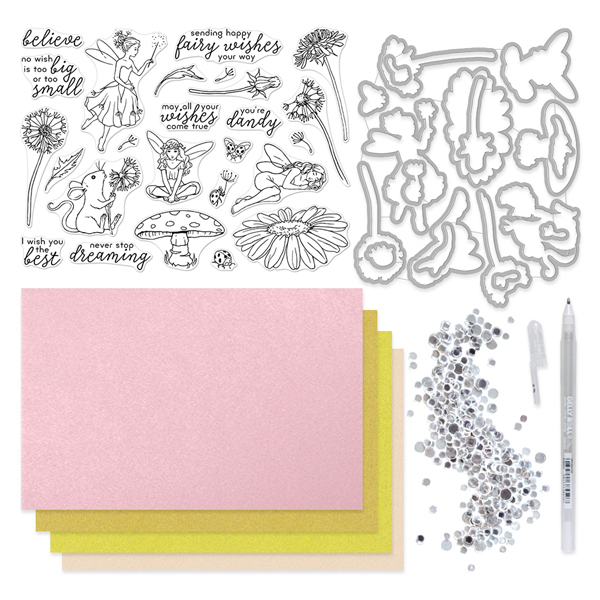 THis is such a wonderful kit - I am loving that stamp set and everyone's interpretation of it! I love the loose artsy look of your water colour version. I usually don't like mice but I have to make an exception for this cutie. Super CUTE mouse card! Great stampset! Such a sweet card. Love the cute mouse. Such and adorable card. I love the watercolor look! Thank you for sharing. Lovely cards. Love the images in the stamp and die set. 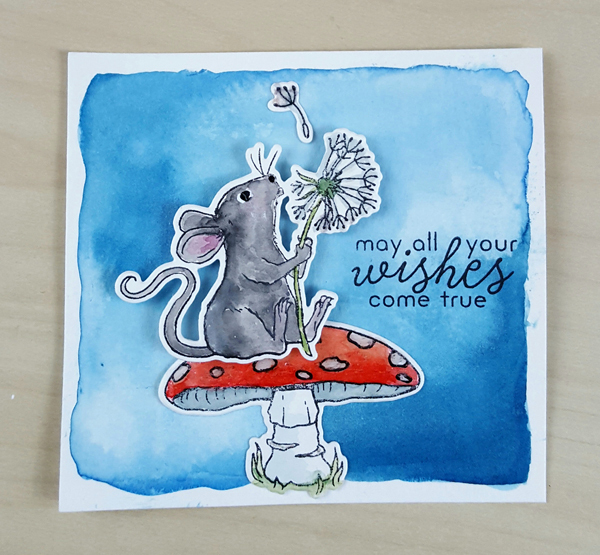 Your cards are so fun with all the whimsical images from Hero Arts December release but it is the gorgeous depth of blue you used that make the mouse card so wonderful! Yes, the mouse is adorable and you have created such a fun scene for it ! Thanks for sharing ! Who wouldn't love to receive this darling little mouse in the mail!? I have fallen in love with this sweet mouse stamp! Thanks for sharing your creativity!